As Geoff mentioned last month, London's Building Center hosted a daylong seminar at the end of May called London Yields: Getting Urban Agriculture off the Ground. The speakers covered a lot of terrain—so, instead of a full recap of the event, the following list simply explores some of the broader ideas, responses, and questions about urban agriculture that stood out from the day's presentations. The event was introduced and moderated by David Barrie, a sustainable development consultant, who framed the day as a collective opportunity to brainstorm ways in which urban agriculture could be moved from mere "sustainable accessory" to become a standard practice of both everyday life and city design. Interestingly, Mark Brearley, Head of Design at Design for London (DfL) and the day's first speaker, provided confirmation of Barrie's diagnosis, confessing that food production was a recent add-on to many of their open space projects. Why? "Because people were asking us about it," he said. Brearley's presentation was an overview of DfL's hundreds of urban regeneration and infrastructure improvement projects; these are, in themselves, interesting but, in aggregate, somewhat exhausting. However, as an office of the London Development Agency, working on behalf of the Mayor of London, Brearley was able to provide a fascinating insight into some of the current institutional priorities that need to be satisfied before urban agriculture can become a standard part of London public policy. For example, DfL's main interest in food production today is in terms of its "public engagement potential" and their primary stumbling block is how to measure the scaleability of local initiatives. Any London-based urban agriculture projects hoping for a mayoral blessing, take note! The second speaker was Carolyn Steel, author of the excellent book Hungry City: How Food Shapes Our Lives. Hungry City traces how food has shaped both the city and its productive hinterland throughout history, from the Sumerian city of Ur to today's London via the markets and gates of ancient Rome. Steel provides a wide-ranging historical look of food production, importation, regulation, and culture, before putting forward her own intriguing and potentially revolutionary proposition: what would happen if we consciously used food as a design tool to create a "sitopic" city? 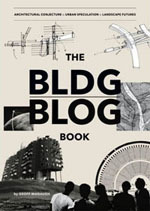 Steel's coinage here, sitopia—from "sitos" (food) and "topos" (place)—is derived from her realization that "food shares with utopia the quality of being cross-disciplinary... capable of transforming not just landscapes, but political structures, public spaces, social relationships, [and] cities." And because "food is necessary," a sitopian city (unlike its utopian cousin) would remain tied to reality and of universal relevance. 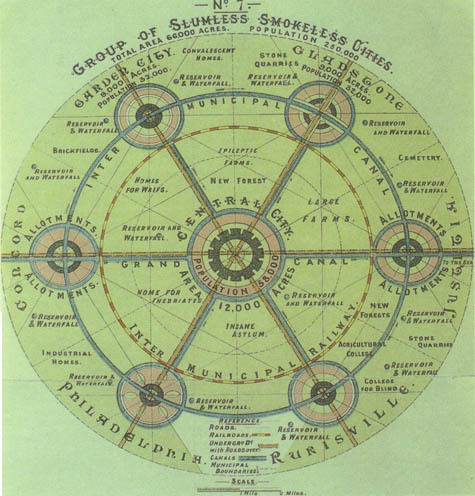 [Image: Ebenezer Howard's original scheme for the Garden Cities of To-morrow shows a landscape reimagined in terms of food production and supply. As Carolyn Steel explains in her own book Hungry City, Howard's plans relied on land reform that was never carried out, and the garden cities of today (Letchworth, Welwyn, etc.) are, as a result, little more than green dormitory suburbs]. Anna Terzi, who runs London Food Link's small grants scheme for Sustain, was the day's third speaker; she described one of their current projects, demonstrating how key insights from both Mark Brearley's and Carolyn Steel's talks might look in action. The Camden partnership's report (still in draft stage) aims to outline a relatively coherent and holistic food program for the borough—a plan that promises to use food to reshape at least this part of the city, in terms of promoting social enterprise, meeting infrastructure needs, and reducing health inequalities. The last two presentations of the day agreed that successfully producing food in the city requires a detailed resource inventory combined with effective promotion efforts. 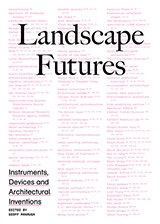 Mikey Tomkins, a PhD candidate at the University of Brighton, described systematically mapping the rooftops, grass patches, vertical faces, and vacant lots of Elephant & Castle—whereupon he discovered that 30% of the area's food needs could be met through the cultivation of found space alone. Architects Katrin Bohn and Andre Viljoen, creators of the uninspiringly named CPUL (Continuous Productive Urban Landscapes), emphasized the need to think about spare inventory in terms of population and three dimensionality (their Urban Agriculture Curtain filled a display window one floor above us). Their research techniques included the accumulation of census data and questionnaires combined with GPS mapping and site visits in order to analyze a landscape's food production capacity. Both Tomkins and Bohn & Viljoen also showed several projects intended to help people read the city in terms of food, using tools as diverse as "edible maps" of London and visual analyses of urban agriculture in Havana, to installations and public events, such as the Continuous Picnic. 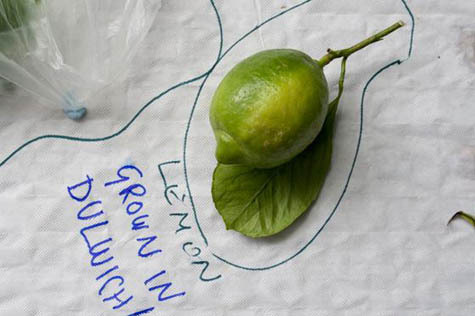 This was a day-long event, part of the 2008 London Festival of Architecture, that included an "Inverted Market" (bring your own locally grown fruit and vegetables to be admired, judged, and then prepared), as well lessons in "Community Composting"; a giant public picnic then spread throughout Russell Square and Montague Place, with connecting corridors between. 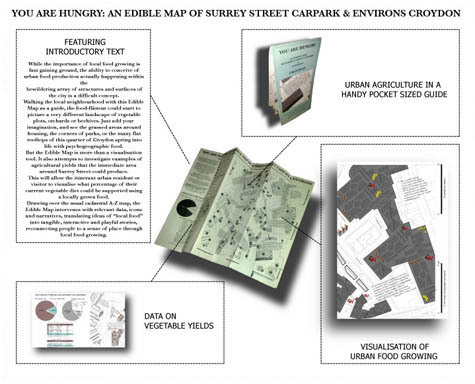 Meanwhile, for his Edible Maps series, an example of which appears below, Tomkins targets a new type of urban resident: the "food-flâneur," who, map in hand, "could start to picture... the grassed areas around housing, the corners of parks, or the many flat rooftops of this quarter of Croydon spring into life with psychogeographic food." Another example of urban agriculture as an opportunity for community activation was Croydon Roof Divercity, Tomkins's collaboration with AOC (previously discussed, along with other AOC projects, on BLDGBLOG here). [Image: From Mikey Tomkins's series of Edible Maps, this guide represents the area around Surrey Street car park, site of Croydon Roof Divercity, in terms of inventory and potential yield]. Throughout the morning, David Barrie repeatedly registered his concern that urban agriculture needed to be economically viable, not just an upscale $64 Tomato lifestyle choice. Several of the presenters added a layer of nuance to Barrie's formulation, noting that cheap food has simply had its costs externalized and hidden (Carolyn Steel) and that organizations like the New Economics Foundation are developing the much-needed tools to measure urban-agriculture-created value, such as increased community engagement and environmental sustainability, which is currently perceived as intangible and qualitative (Katrin Bohn). Mikey Tomkins argued against an economics-based one-size-fits-all approach to urban agriculture, explaining that the scale of a food growing project determines its possible benefits. Thus differentiated, food gardening generates educational and quality of life outcomes and should be measured accordingly, while market gardening creates recycling benefits, and urban agriculture can be evaluated in terms of yield. Finally, the elephant in the room was the degree of coordination and regulation needed to transform London into a food-producing landscape. 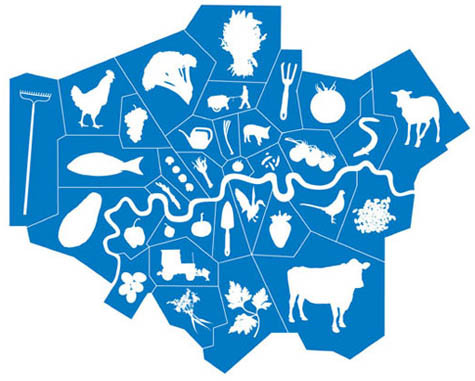 In an environment where, as Carolyn Steel said, the supermarkets where Londoners buy more than 80% of their groceries refused to participate in consultations with the Mayor's London Food Strategy, it seems unlikely that sustainable food production and distribution will become the norm without legislative intervention. 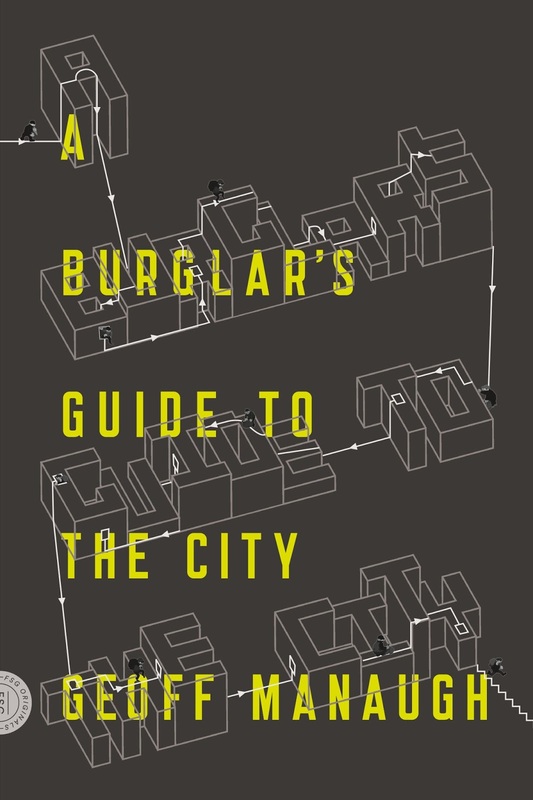 In her book, Steel quotes Cassiodorus, a Roman statesman who wrote: "You who control the transportation of food supplies are in charge, so to speak, of the city's lifeline, of its very throat." At the moment, Steel tells us, roughly 30 agrifood conglomerates—unelected, and with no responsibility other than to their shareholders—have almost unfettered control over London's food supply. Until that changes, urban agriculture can't help but remain "at the artwork stage"—an inspiring, attractive, and completely optional extra. [Previous guest posts by Nicola Twilley include Watershed Down, The Water Menu, Atmospheric Intoxication, Park Stories, and Zones of Exclusion]. Seattle recently repealed a law that prohibited gardening in the little plots of dirt between sidewalks and roads. There's some concern that these patches of dirt are too polluted to produce safe food, but Seattle has very energetic and well educated gardeners (they even have a Compost Hotline...) and there's a lot of activity now planting these strips to see what kind of quality can be produced. You might find some of the work being done in Northeast Ohio by the Kent State University Cleveland Urban Design Collaborative interesting. Their Shrinking Cities Institute recently produced the Re-Imagining a More Sustainable Cleveland reports(http://www.cudc.kent.edu/shrink/landlab.html), which present strategies for returning vacant properties to productive use at the city-wide scale. Exciting to hear about these initiatives in other cities - thank you for the leads, kiel, malwae, and david. Throughout history cities, by definition, have externalised their food supply. The city killed the village. Re-imagining cities as villages would enable the necessary transformations to occur to some extent - especially if the asphalt is rationalised - but high population densities will always work against this transformation. For most cities, our best bet is probably to redesign the suburbs as villages. Village Homes in Davis California (see Bill Mollison's Global Gardener video), and Jarlanbah Permaculture Hamlet in Nimbin, Australia come to mind. So maybe the way forward is (re)development of the suburbs, and the inner city (where the major impetus is currently, probably due to greenspace deprivation and high levels of education) will never viably transform because of the population density problem. Same as it ever was. Well designed and organised suburbs, however, can supply food for themselves, the CBD and more! Which is not to disparage food in the city proper - the more the merrier, definitely. Also, consider the Permaculture notion of zoning, whereby you put plants that you visit most often closest to your backdoor. If you apply this idea to a city rather than one yard, the GPO becomes the centre of the design and everybody supplies the plant interactions. By implication, cut and come again greens, sprouts and herbs are a very sensible edibles focus for inner cities, and growing them as close to kitchens as possible would be beneficial. Lightwells? Balconies on office buildings? Hundertwasser style 'vegie tenants'? "I am increasingly realizing that food is a prism through which to explore many dimensions of sustainability - from local economic development to better ecological practice to social stability and opportunity." Mr. Howard's design for his "Garden Cities of To-morrow" (you have to love the historic hyphen) is remarkably similar to the design of J. Crawford's "Carfree Cities". Perhaps its time has come? While I agree that many UA projects seem tokenistic, the assumption that UA must remain at an artwork stage until the conglomerates are displaced seems incorrect; Put into the context of coming food crisis, those multinationals are going to be unable to continue to provide food to everyone. There is going to be a widespread systemic collapse. If urban agriculture projects are in place, as seeds, perhaps it can be somewhat controlled. A city becomes a very different place in three days without food. If the interest can spread, and enough test sites are in place when this crisis starts becoming more real, then we will see the relevance of UA. And these projects now will be the templates for the coming change.